I’ve been enjoying the ‘black and white and red all over’ color scheme a lot lately. It’s the first thing I thought of when I started developing my new chicken pattern. 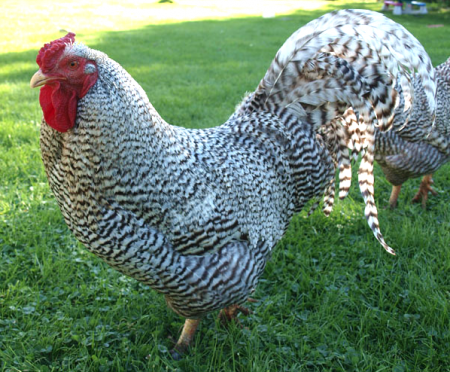 You may think of white chickens, or Rhode Island Reds, but I was inspired by a short story I once read about “Dominikers” or black-and-white Dominique chickens. 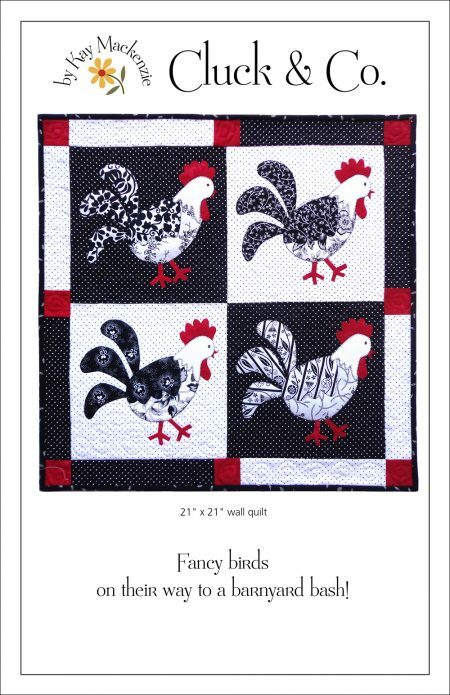 Here’s my new pattern, Cluck & Co. Four fancy chicks are stepping out in style! I used raw-edge fusible machine appliqué for my version. 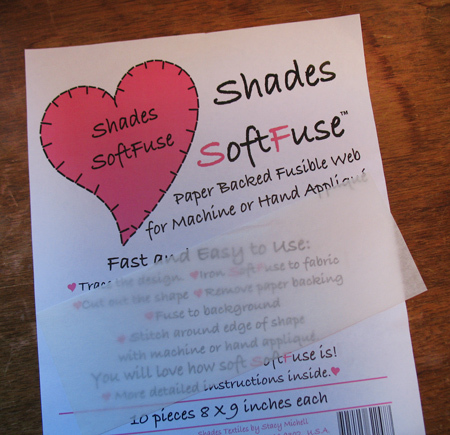 For a refresher on that method, here’s a link to my Raw-Edge Fusible Demo. Of course you can always use your own method if you favor another one. It’s all good! Another trick that I pulled out of the bag for this one was the double-layer strategy for the heads, to avoid shadow-through when putting light over dark. 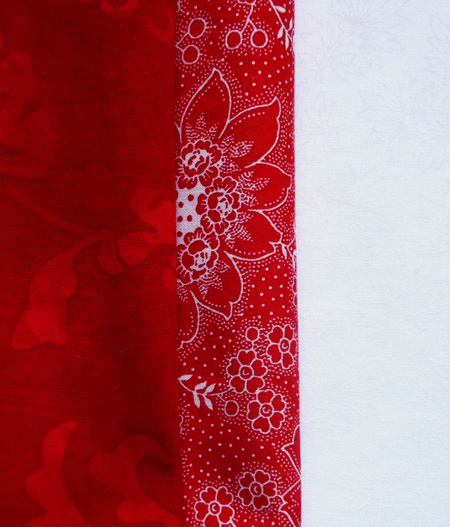 Just fuse two layers of light fabric together, then use this composed fabric just like the others in your project. Hope you are enjoying your summer! I have a couple months off from shows and have been knee-deep in foster kittens! A very happy new year to you! Hope you’re warm and safe, wherever you may be. I finished a new pattern! Four appliqué Rose Wreath blocks, set on point, framed and sashed with the gorgeous prints of your choice. It’s a lovely table runner, or a banner! I used fusible machine appliqué for the blocks. Here’s a link to a photo tutorial on the method. Back when the spring issue of 100 Blocks came out, I promised that I would post a tutorial of the way that I made my block, Scroll Heart. The magazine published instructions for fusible appliqué, but I had actually stitched the block by hand, using back-basting and a combination of regular and reverse appliqué. I’ll show you how I did it. 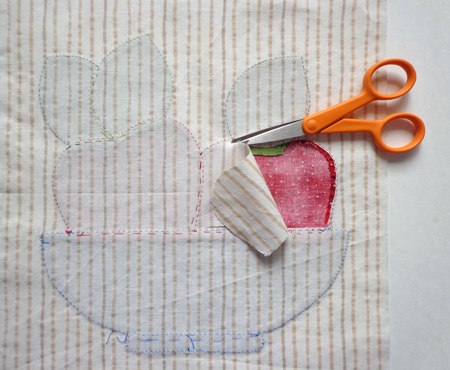 You might want to start by reviewing the tutorial on back-basting hand appliqué. Now for our Scroll Heart. I hauled my original pattern out of its file folder. Because it’s a 12″ block, the pattern was folded. I ironed it on low, under a pressing sheet, just to flatten it out a mite. Notice my pencil notation at the top, “rev.” That means that this is the reversed version of the pattern. I’ve learned to mark this when I file things away. For back-basting, you need to start with a reversed pattern. I pulled fabrics for the block. 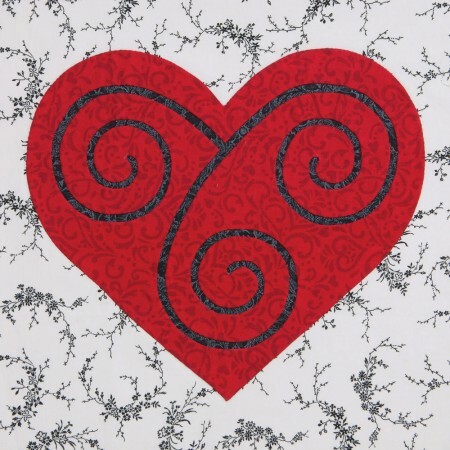 Julie suggested,“I would love to see it tone on tone, with the scroll being a bit darker shade than the heart.” After selecting the fabrics, I decided to do it the other way around, with the lighter red print being revealed for the scroll. 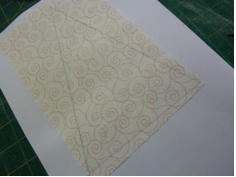 In back-basting, you start by tracing the pattern onto the back of the background fabric. 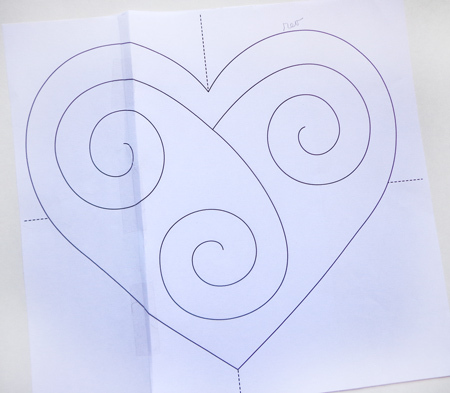 Typically this marking delineates the appliqué turning line. In this case, I’m going to use it for two purposes. 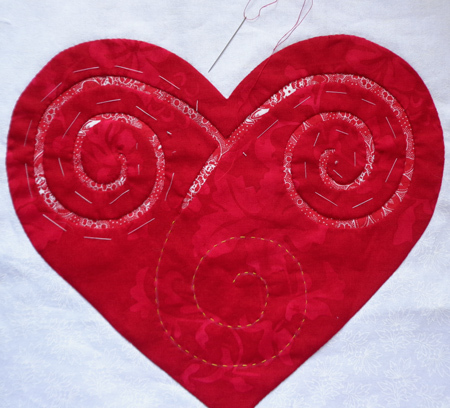 It will mark the turning line for the outside of the heart, and it will mark the cutting line for the reverse appliqué scroll. Usually I use a water-erasable marking pen. This time I used a pencil, because I’m working with dark red fabric for the appliqué. Dark. Red. Fabric. Just sayin’. Now for the reveal layer, which will appear under the scroll. 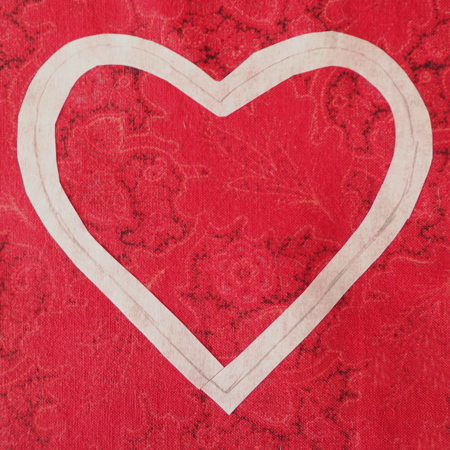 Using a light box with the pattern underneath, I drew a chalk mark on my insert fabric, in between the scroll and the heart. 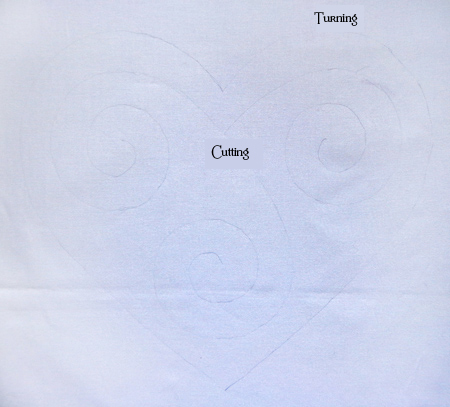 This will give me the shape to cut out, which will cover the scroll but miss the edge of the heart. On the front, lay the reveal fabric, aka secret layer, on the background square, over the scroll area. You can use a light box or hold the fabrics up to the light to make sure it’s well placed. Pin from the back. 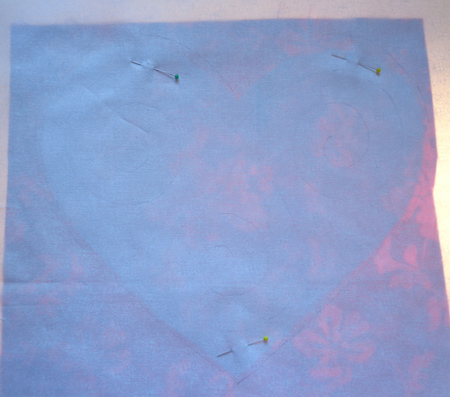 On the front, lay the heart fabric over the background and reveal fabric, making sure it covers the outside of the heart with a little bit to spare. 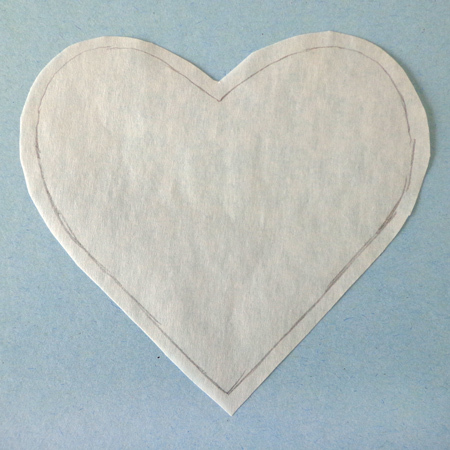 The heart fabric can be any rough-cut hunk or chunk, as long as it covers. Remove the pins from the reveal layer and pin all three layers together from the back. This is the front, on the light box so it looks weird. Same thing from the back. Now for the back-basting. 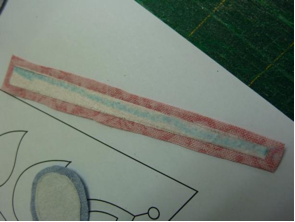 Use a bright or contrasting thread that is thick or fuzzy, and a big honking needle. You want the basting to make larger holes, to give the appliqué fabric a memory of where it should turn later, when you’re stitching. On the back, along the drawn lines, baste through all layers around the outside of the heart and along the scroll. Remove the pins. 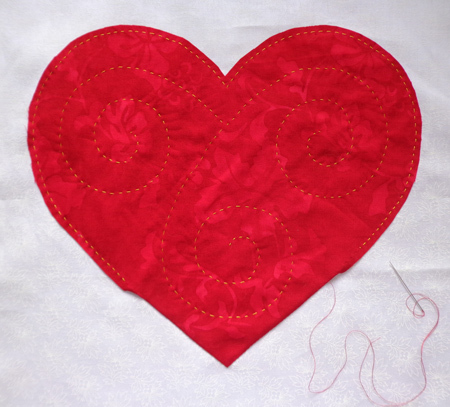 On the front, trim the red fabric to the shape of the heart, leaving a turning allowance outside of the basting stitches of about 3/16″. 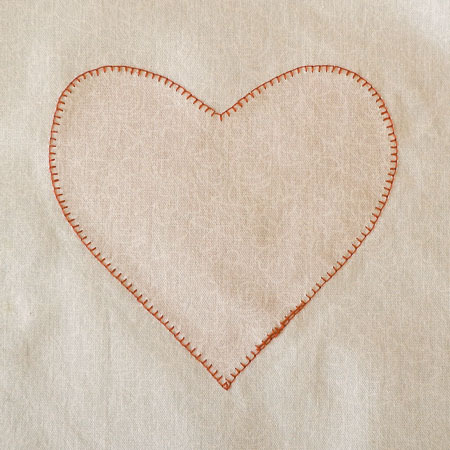 The outside line is going to be regular appliqué, making the heart cover up the background fabric. The inside scroll lines are going to be reverse appliqué, revealing what’s underneath. That’s the only difference between regular and reverse appliqué. Regular covers up, reverse reveals. 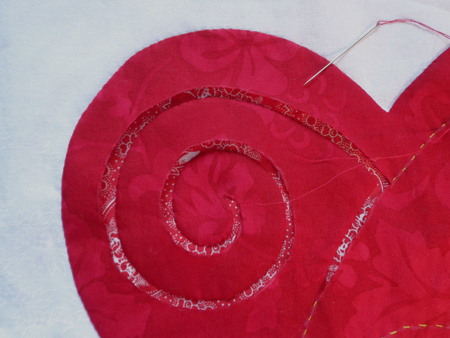 I’m going to stitch the outside of the heart first, so that I won’t ravel the raw edges while I’m working on the interior. Removing the basting a little at a time, I’m hand stitching using traditional needle turn. The heart is finished, time to work on the scroll. To make sure I could clearly see the cutting line once the back-basting was removed, I went over the basting stitches with a white marking pencil on the front. Stitching the scroll is going to resemble Hawaiian appliqué, or cutaway appliqué. 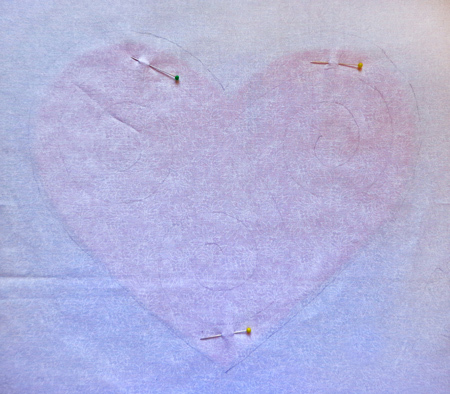 I’m going to remove the basting a little at a time, cut the heart fabric only along the dotted line, and turn and stitch using traditional needle turn. One side of the first scroll is stitched. I’m turning under as little as possible, about 1/8″. The amount that you turn under doesn’t matter so much as that it’s consistent. Once you’ve finished one side of the scroll, you’ll need to large-baste the other side, or else it’ll be flapping in the breeze. Just keep removing the back-basting, cutting, and stitching your way around both sides of each scroll, a little at a time. I turned under such a small amount that I didn’t even have to clip any curves. Keep on going around; it’ll be one continuous line until you come back to the beginning. So cool!! Remove the large basting, press, and you’re done! Cute! I hope this has been a helpful tutorial, and has shed some light on the mysterious subject of reverse appliqué. 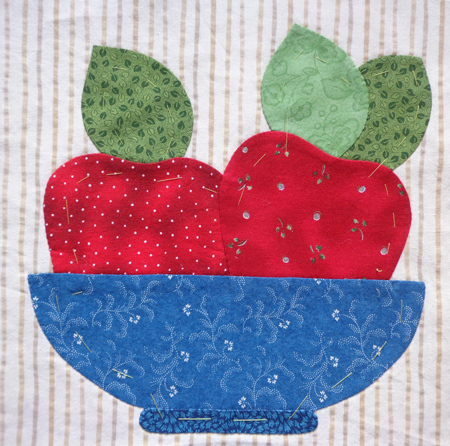 Have you ever finished an appliqué block and then had second thoughts about the background fabric you chose? Maybe It doesn’t look the way you thought it would. Or the appliqués end up blending into the background a little more than you’d like. Maybe the project ended up taking a different direction. Whatever the reason, sometimes you wish that cute block you stitched was on a different background. Maniac that I am, I have actually twice successfully swapped out the background on a completed block, without starting over!! I’ll show you how I did it, then you can decide if it’s crazy or total genius. 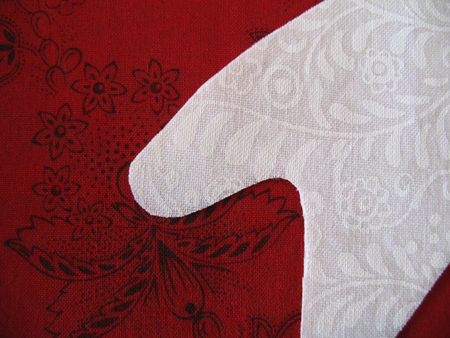 Note: This applies to hand-appliquéd blocks, not fused or machine-stitched. Here’s the Apples block from my first Martingale book, Easy Appliqué Blocks. See, there it is, right on the cover. 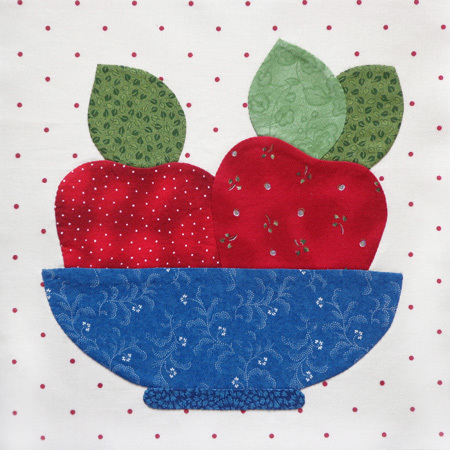 Now, that beige stripey background is okay, but when I was looking for a block to use for this tutorial, I got to thinking, wouldn’t that bowl of apples look nice zhuzhed up on some red polky-dots? I’ll walk you through the process. You will need to do some basting, some trimming, some tweezering, and some re-stitching. BUT you will not have to restitch everything! Where one motif goes over the top of another one, that part does not have to be restitched. (Except for a little overlapping to secure threads.) Here’s my attempt at telestration in Photoshop to show you those areas. Start by cutting a square of the new background fabric that is the same size as the existing one. 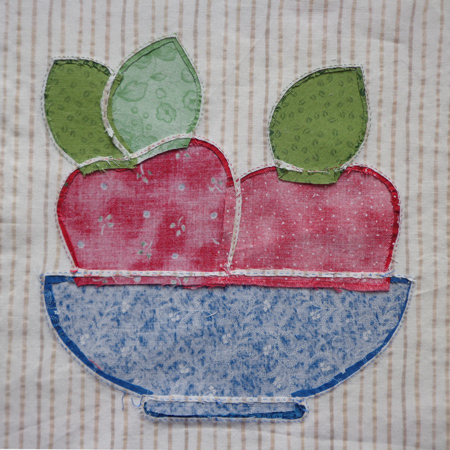 On the back of the stitched block, cut away the background fabric inside each appliqué piece, close to the stitching. Keep the lower blade of the scissors on top of the turning allowance. Starting to cut away the interior background. Remove the interior background fabric. 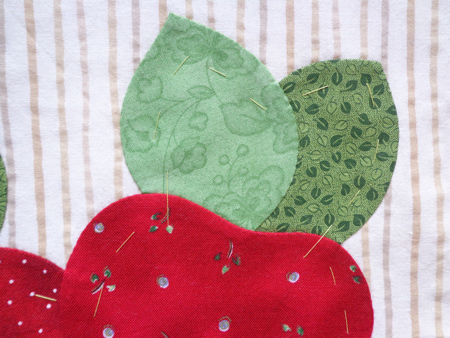 Those little lines of background behind the stitching that is going to remain… just leave ’em. Okay, if they really bother you, you can tweezer them out, but leaving them in place will keep the stitches tight, and will not affect the appearance of the refurbished block. Interior all cut away, leaving lines in place that do not need to be restitched. Layer the block on top of the new background. 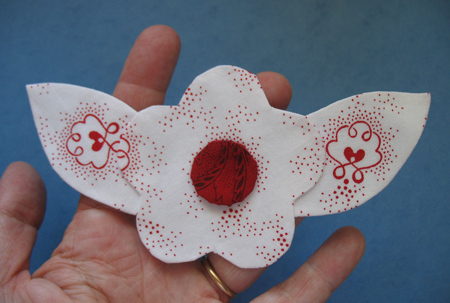 Baste them together all around the perimeter of the appliqués, a scant ½” inside the stitching lines. Basted together, inside the stitching. 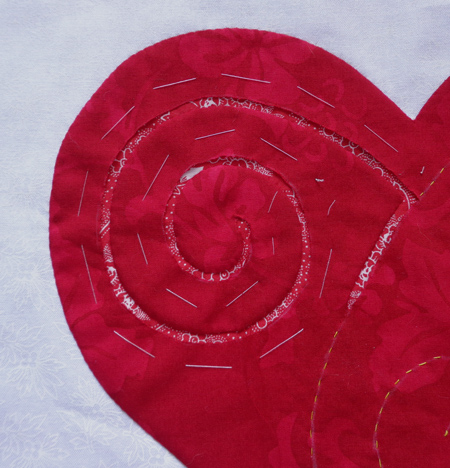 A little at a time, use the seam ripper to remove the previous appliqué stitching. 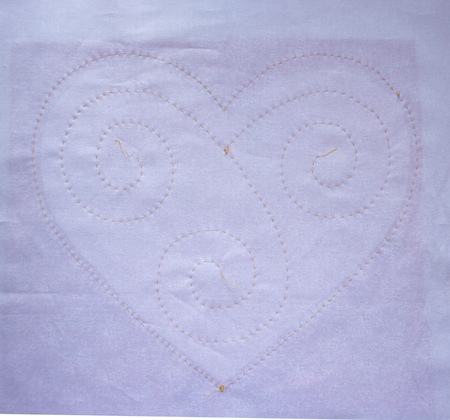 Once you get it started, this is easily done by lifting the edge of the appliqué. The old background fabric outside the perimeter will come loose and you can cut it away in hunks. Tweezers come in handy for removing little bits of thread and background. Old stitches removed, a hunk of the old background gone, starting to restitch. Restitch the appliqués to the new background, changing thread color as needed. You’ll find this to be easy stitching! The edge is already turned and creased, and behaves itself beautifully, acting like prepared-edge appliqué. 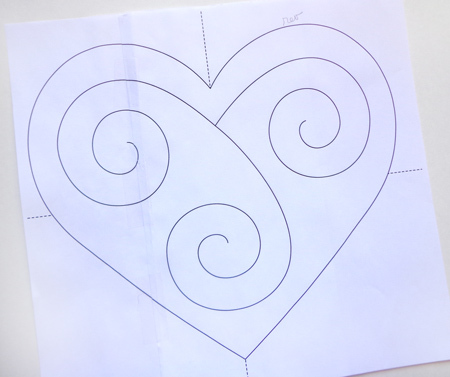 When you come to a place where one motif crosses on top of another one (as shown in the telestrated example above), sew over the area a little bit to secure the existing stitching, then continue on around the perimeter. Once everything is restitched, remove the basting. Volume 11 winner, and let’s talk about reverse appliqué! The blog tourist who came up the winner of a copy of 100 Blocks Volume 11 is… Julie in WA! Congratulations to Julie, who reports that she enjoys every minute of the blog hop and is always sad when it ends. 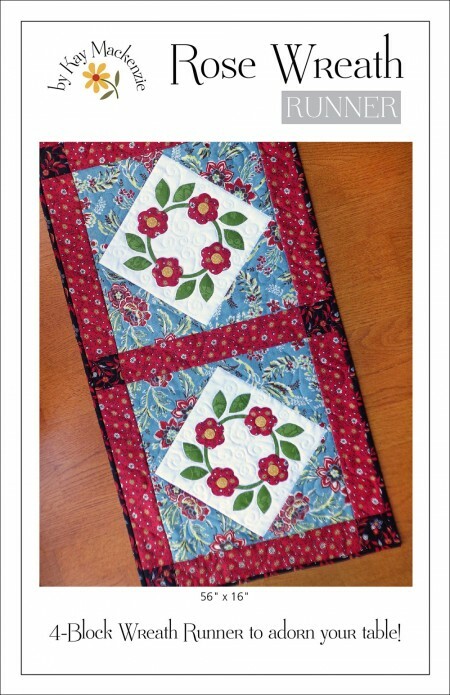 Julie will receive a copy of Volume 11 from Quiltmaker. Thank you so much to everyone who stopped by, and for your lovely, wonderful words. 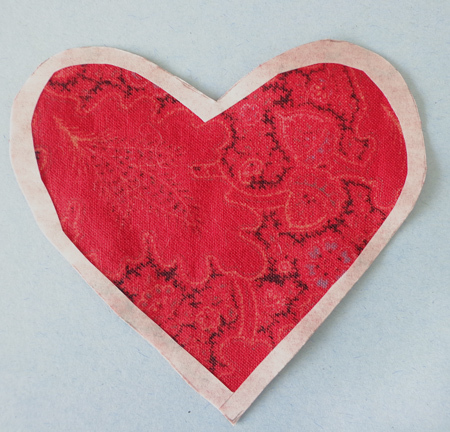 The magazine gave instructions for the block using fusible appliqué, applying the black scroll on top of the heart. QuiltMouse, who tested my block for the magazine, used fusible as well but cut the scroll out of the heart and laid it on top of the black, thus devising a form of raw-edge reverse appliqué. Genius! 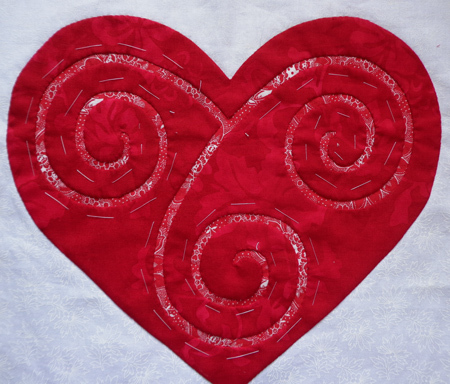 Some readers referred to Celtic appliqué. I like it, it has a celtic feel to it. 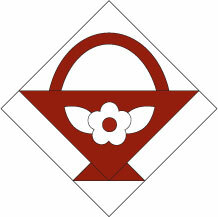 I’ve always wanted to try celtic applique. This would be a good way to get a feel for it. I love it! I would do bias tape fusible, Celtic-style. Celtic-style would be another way to go about it! I haven’t done a lot of Celtic appliqué, but I understand how it’s done. Bias strips with turned edges are interwoven and stitched down to create beautiful knots and border designs. This is regular appliqué. Here’s a current book on the subject. When we submit our blocks to 100 Blocks, we don’t send any instructions. The editors of the magazine write the instructions. Though the magazine gives directions for fusible appliqué, I stitched mine by hand. 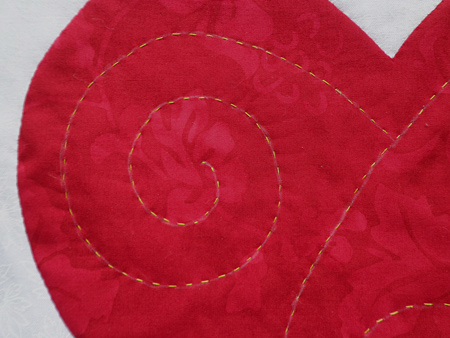 I mentioned this in my blog hop post… the outer edges are regular appliqué, and the scroll is reverse appliqué. When reviewing the comments, I noticed a trend. The only time I tried reverse appliqué it was a disaster; it’s definitely time I tried again with good instructions! that sure is a lot of work, you must love applique. Stunning – it looks like a load of work but I bet it’s not that bad! I can’t imagine how you did that reverse applique on those tiny pieces. I would have loved to look over your shoulder as you created this and learned how you did the turned edge/reverse appliqué. I have never tried reverse applique before, but it needs to happen soon. I have been wanting to try reverse applique. 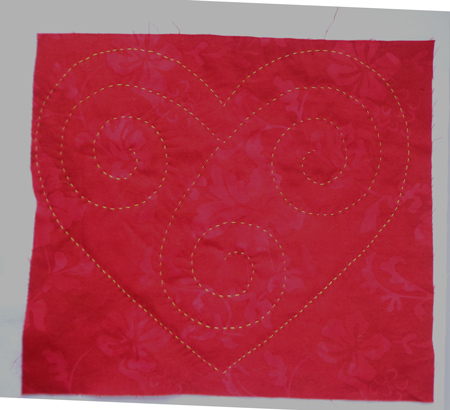 Darling block, got to try reverse applique – I love needle turn applique – so this hopefully won’t be a big stretch to learn! I’d love to learn reverse appliqué one day. Maybe this is my chance to take a stab at trying reverse applique. 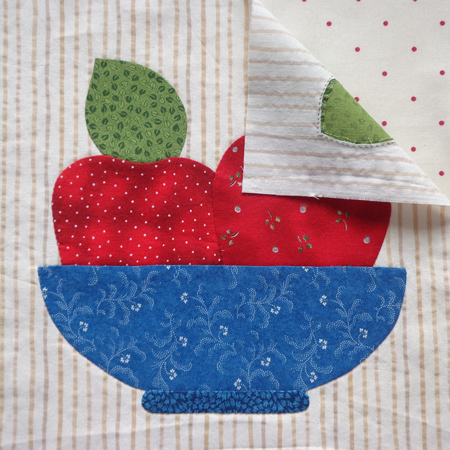 I have never tried reverse applique before…this looks like the perfect block to try it on! I think I might try the reverse applique method. 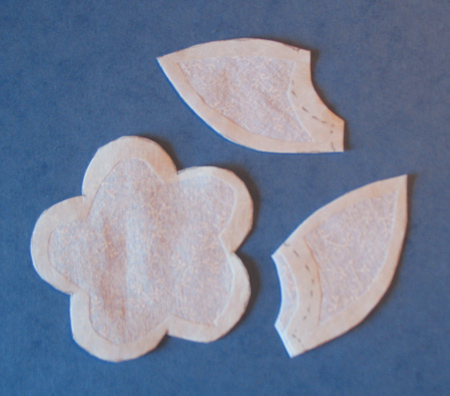 It might even be easier than hand applique. 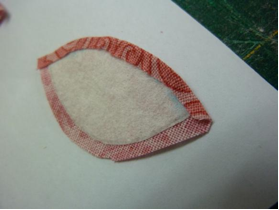 Reverse applique on a curve – wow. I need to try that! 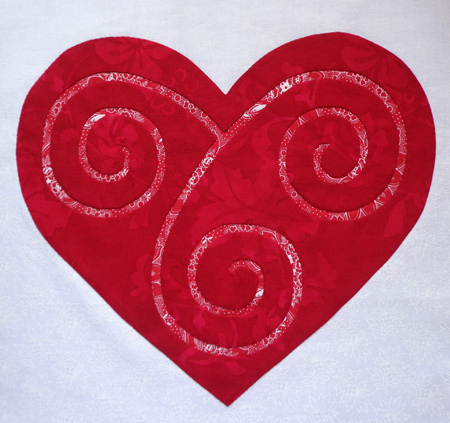 Reverse applique is something for me to learn as it looks amazing in your scrolls on that lovely heart. I’ve tried a bit of hand applique and really enjoy it, but I’ve not tried reverse applique yet. Gorgeous heart block! I haven’t tried reverse appliqué, but it is on my list of techniques to try. 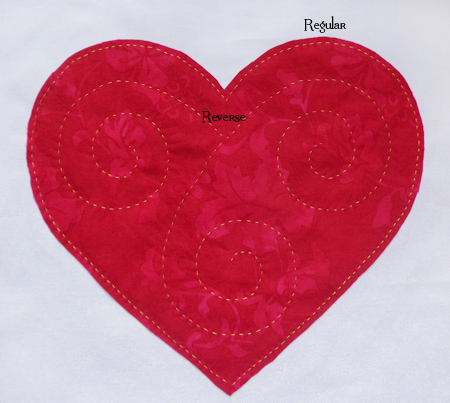 This could be a good way to ease into reverse applique–only a few corners. 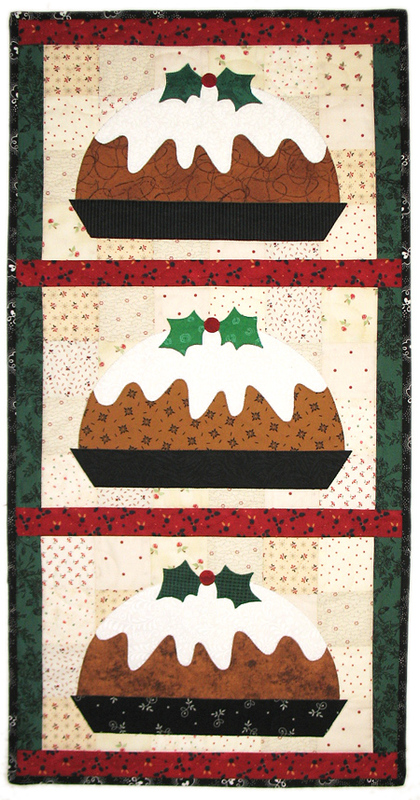 I have never tried reverse applique, I may have to come back if I decide to attempt with this block. 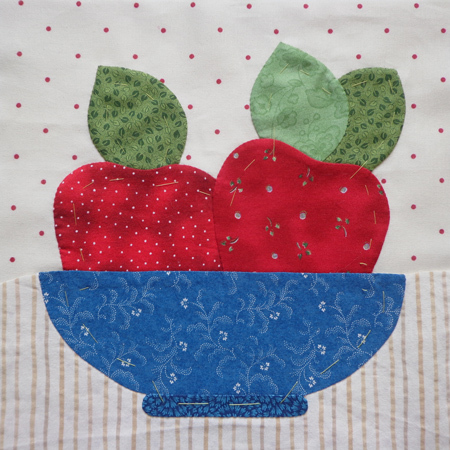 I have never done reverse applique but think your block would be a good one to try it on. I find reverse applique to be very interesting but I have never tried it. I haven’t tried reverse applique in years, but your block tempts me. Lovely block, I’ve never tried reverse appliqué. Will you be offering a tutorial? What’s all this mystery surrounding reverse appliqué? To those who say they have never done it… guess what! It’s the same as regular appliqué! That’s right, let me say it again. 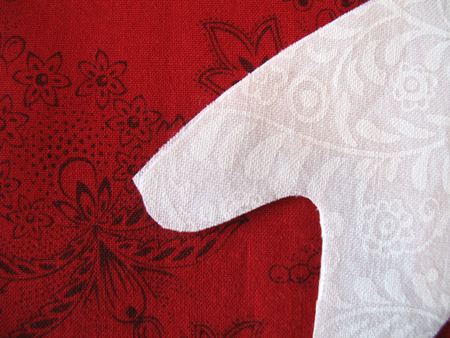 Reverse appliqué is no different than regular appliqué. You’re just revealing the background instead of covering it up. Under the terms of my agreement with Quiltmaker, I cannot give instructions for the block at this time. However, when the rights revert to me (three months after publication, in mid-August), I will be more than happy to put up a photo tutorial of how I made this block. I’ll take Julie’s suggestion: “I would love to see it tone on tone, with the scroll being a bit darker shade than the heart.” You got it! The winner of Nature’s Beauty in Appliqué is Helen Lebrett! Congratulations! Helen, be sure to reply to my email so that I can get your prize sent out to you. I subscribe to the Checker News Blog. Checker Distributors is one of the largest companies supplying our independent quilt shops with everything they could need and more. Their news blog is geared toward retailers, but reading it is a great way to see what’s new, cool, and groovy in Quiltland. 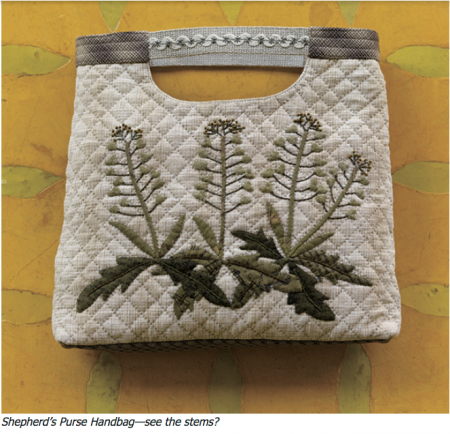 Penny Haren, author of the Pieced Appliqué series of books, is a consultant for Checker and does most of the blogging. Recently she posted the story of an old appliqué top that was relegated to the closet for a number of years after the fabrics faded, and how she was able to bring it back to new life. I found this fascinating! Linda Franz is one of my most revered associates in the quilting world. When I first stuck a toe into publishing, I saw that she had produced the fabulous Quilted Diamonds on her own, and I contacted her with questions. Linda immediately became a mentor to me, answering at length and providing the most wonderful encouragement. I’ve watched over the years as Linda has continued trail-blazing. She is the inventor of Inklingo, a system of printing on fabric that provides a myriad of benefits for both patchwork and appliqué. 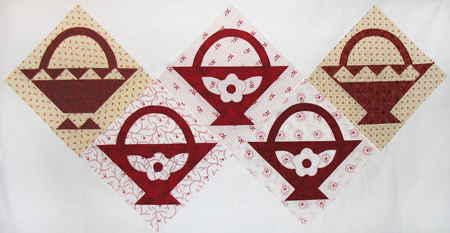 Recently Linda posted a tutorial on Quilting Hub about back-basting with Inklingo that you’ll just have to go and see. Among Linda’s many skills is photography, and the quality of her photo tutorials is unsurpassed. You’ll also meet Linda’s friend Monkey, who helps demonstrate during the tutorials. Hello everyone! Back safe and sound from SoCal. I’m excited… this post has been cooking for over a year now! I met Australian quilter and stitcher extraordinaire Helen Stubbings at Market a couple of times, and we finally got it together for her to do a guest post on her method of appliqué! You are going to love this! Take it away Helen! 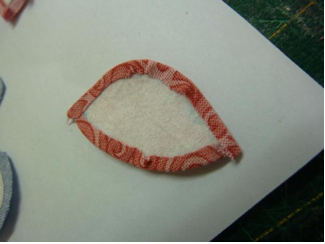 This easy or some would say ‘cheats’ method of needleturn applique takes the scare factor out of needleturn. Most of the work is in the preparation, leaving the actual stitching as the easy bit. 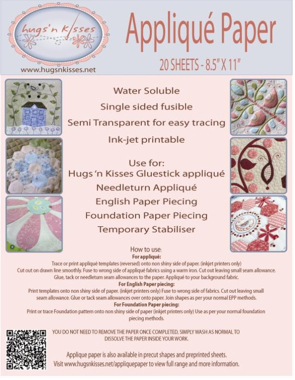 The method uses two products – Hugs ‘n Kisses Applique Paper and a glue pen – I use the Sewline Water-Soluble Glue Pen. Place a sheet of applique paper with the shiny (glue) side down on top of your template or design printed sheet. 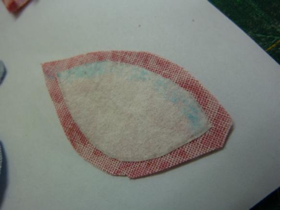 It is semitransparent so you can easily see the design through the paper. 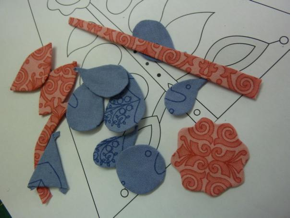 Trace each design or template shape onto the paper – I like to use a Sewline Ceramic pencil which glides on nicely. 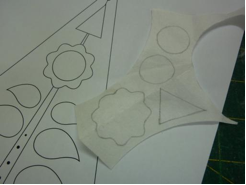 Note: if your applique design is directional you need to reverse it for this method. 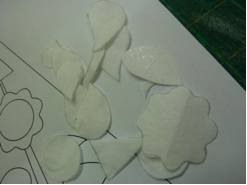 Cut out each shape carefully on the traced lines. This is the important part – be as careful as possible as this determines your final shape. Fuse each shape to the wrong side of your chosen fabrics. 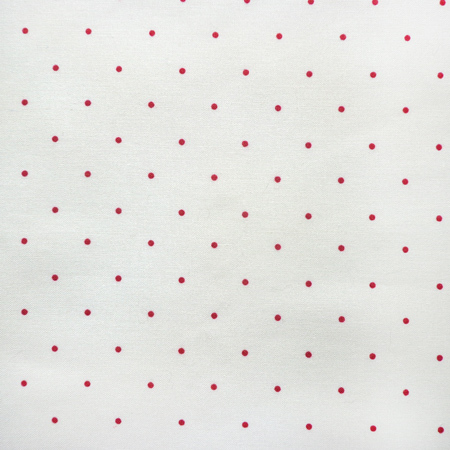 You need to leave a large ¼” between shapes for seam allowances. 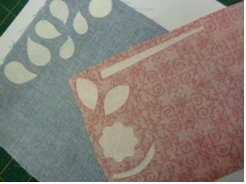 If you wish, you can fussy-cut your fabrics by positioning the shapes to suit. Cut out each shape leaving an approximate 1/8” seam allowance. 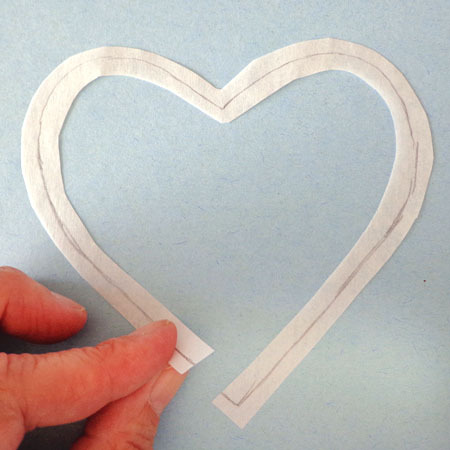 Using the glue pen, run a line of glue along the edge of the paper template –- it only needs to be light and right on the edge. 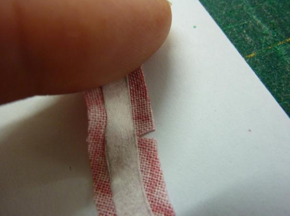 Using your thumb and forefinger, gently press over the seam allowance onto the glue. 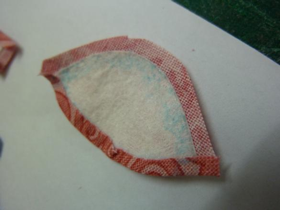 You want to fold the fabric on the edge of the paper –- but you don’t want to fold the paper as well, it doesn’t take too long to get the feel of the edge of the paper and where to fold to. If the end of your applique piece is going to be under another piece in the final design you do not need to glue and fold these edges over. You do not need to clip into outer curves. Our seam allowance is small and often on the bias so clipping is not necessary. Just gently fold/pleat around curves a small step at a time so you do not get points. If you are having trouble eliminating points try trimming back the seam allowance a little further. If you have tails like on this leaf, just leave those and they will be dealt with later. You will need to clip on inner curves – but not as much as you may be used to. Just clip where you absolutely need to to enable the seam allowances to fold in nicely. Inner points need to be clipped to the edge of the paper. Continue glueing until all shapes are prepared. Position your background fabric over the design sheet. 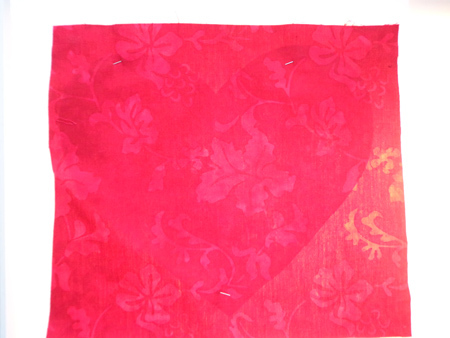 Use a light box if you cannot easily see through the fabric. Position and layer all applique pieces following the design you can see underneath. 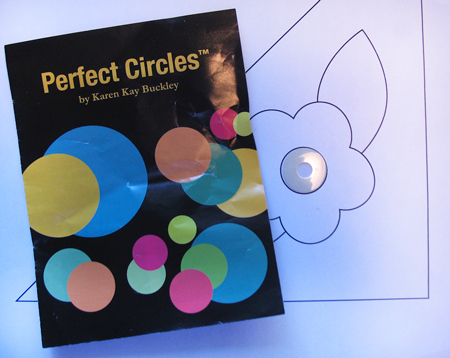 Use the glue pen or for larger projects Roxanne’s Glue baste it to secure all pieces at once. Just layer them up until the complete block is ready for stitching. 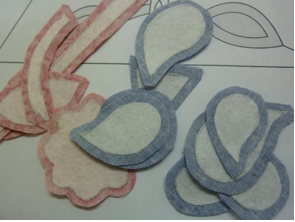 Now you can stitch all pieces down as you would for your normal applique method. I use Hugs ‘n Kisses applique needles and Superior Bottom Line threads but you can use your thread of choice. When stitching down those tails that are showing, stitch to the point and do a double stitch to hold, tuck under the tail with the tip of your needle and continue in the new direction. No need to remove the papers – when it is washed they will just dissolve and soften into safe fibres in your quilt project. 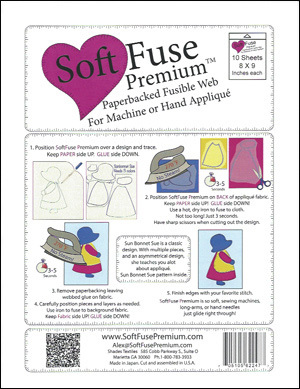 All of our Hugs ‘n Kisses applique patterns include the full design sheet along with reversed where necessary templates and applique shapes for tracing. 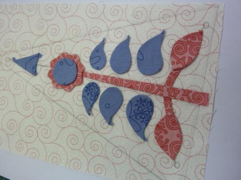 We are considering including pre-printed Applique Paper in our patterns in the future –- so you can just cut out, glue and stitch! Wow, what a treasure! 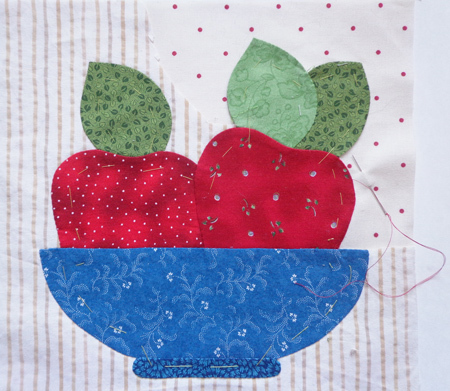 Over on the Martingale blog Stitch This! there’s a hand appliqué tutorial from appliqué icon Mimi Dietrich. Mimi is the author of many wonderful appliqué titles. 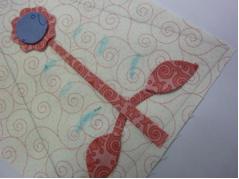 In this illustrated tutorial she gives the “freezer paper on the back” method, complete with stitching tips. Thanks Mimi! 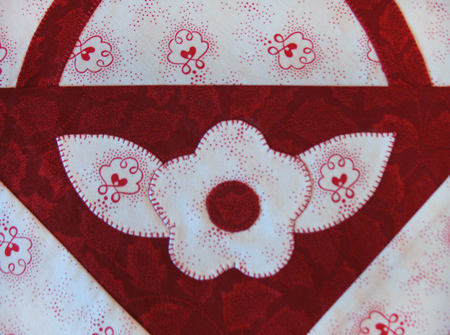 Not only that, Martingale has put her book Mimi Dietrich’s Favorite Appliqué Quilts on sale at 40% off this week. And I was very tickled to see that this sale also includes my book Inspired by Tradition. Now that’s good company! Hello fellow appliqué enthusiasts! I return after a week on the east coast sporting “The Bug Bite That Ate Cleveland,” achieved during a hot spell that nearly did me in. 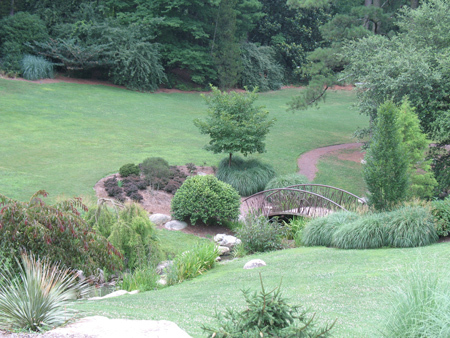 We got from the parking lot to the gates of our beloved Duke Gardens and I could go no further. We came back the next day after breakfast and I had a much better time of it (but still had to retreat to the air-conditioned visitor center in some distress, to recuperate). And I understand it’s even worse right now! 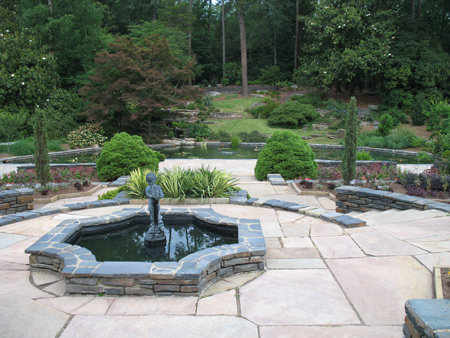 Just one of many pleasing scenes throughout the gardens. There are many fountains; behind this one there's a pond that's special to me. My dad used to bring us kids here when we were growing up. It's a koi pond. 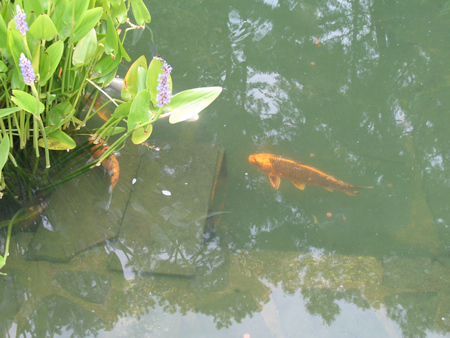 Of course, we just called them giant goldfish. 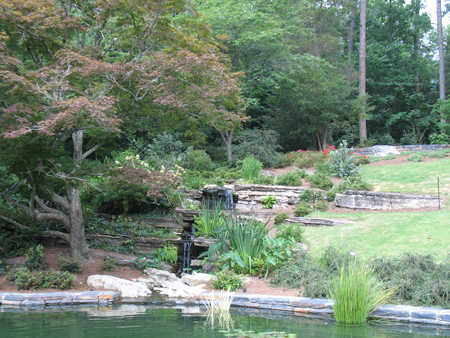 Dana and I used to visit Duke Gardens when we were in the courting stage, and during the early years of our marriage. This place has a lot of sentimental value for us both. After visiting with my folks and our friends in North Carolina, we drove up to see Dana’s mother and her permanent BF Richard. 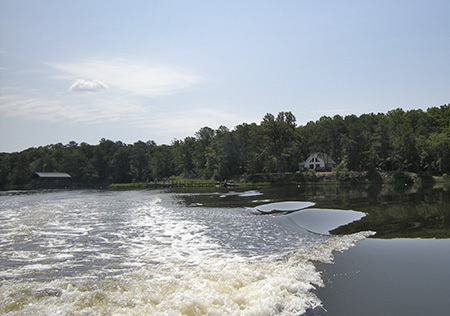 They have a weekend river house on the Corrotoman, a tributary of the Rappahannock in the Northern Neck of Virginia. It was a beautiful locale and a charming little house with all the modern comforts. They had recently acquired a boat. We set out on the maiden voyage of the season. Just after this photo, looking back on the river house, the motor… quit. And there we sat. It wouldn’t start up again for love or money. I was the first one to get an oar in the water and start talking about Spartacus, but the menfolk quickly took over the paddling chore and I retreated to the scant shade of the canopy. Thankfully, a little fishing boat pulled up alongside, moored itself to us fore and aft, and puttered us the rest of the way back to the slip. And, it turned out that the woman was a second or third cousin of Richard’s! “That’s the Northern Neck,” they told us. It was good to catch up with family and friends, but seriously I was never so glad to touch down in northern California once again. With all this talk about hot muggy weather, you may wonder why the title of this post is about wool appliqué LOL! 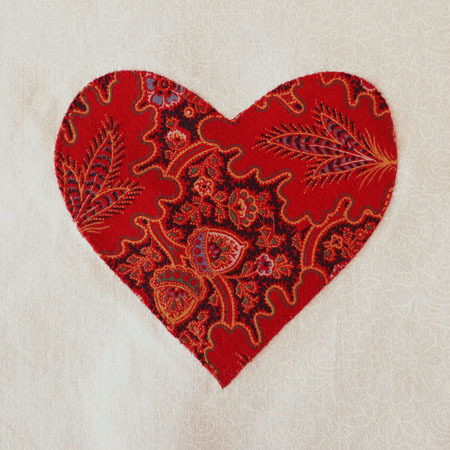 There’s a great photo tutorial over at Quilty Pleasures, the Quiltmaker blog. If you’re feeling cool enough, be sure to check it out, or, you can always bookmark it for wintry times! I need to know everything! I have a wonderful teacher but she lives a long ways from me. I pretty much just drink in all the information I can get my hands on. Make more books and more patterns — there can never be enough! Donna also wrote that she need to know the pros and cons of glue basting. Personally I don’t use glue or starch (with the exception of a dab of glue stick in certain specialty situations) but I know that many appliquérs couldn’t live without glueing the edges of their pieces over. It all depends on what you prefer. Myself I’m in the camp of less prep and let’s get to the stitching, but then again needle-turn is like breathing for me. 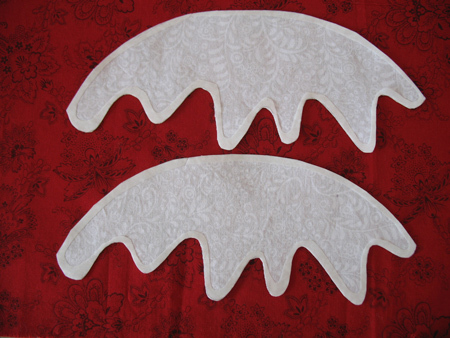 Other appliquérs do not enjoy the edge-turning process and would rather have it done in advance. It’s all good! Whatever gives you the satisfaction in the process and the happiness with the result, that’s what you should do. Here are the pros and cons of glue from my personal perspective. • It’s a prepared-edge method, which means you don’t have to turn the edge while stitching. You just get to stitch away. • You get glue on your fingers. Ew. • You have glue in your project. • It’s more prep time before getting to the stitching. • You have to make templates. If you know of more pros and cons, please chime in! Here’s a roundup of glue-related posts from the blog. (I got this by clicking on “Glue stick” in the Category list.) I’d pay particular attention to Holly’s method and Laurel’s book. In other news, Anne Sutton posted about an upcoming on-line sewing competition show called Sliced. Ooooh that has got to be good. I can’t wait! Reminder: I’ll be at the upcoming Pajaro Valley Quilt Association’s annual show, February 25-26. My booth is #30, the first one on the right as you come into the main building, aka the Crosetti building. Our featured speaker is amazing pictorial quilt artist Linda Schmidt. There’s a fashion show and a quilt auction, a bed turning, door prizes, guild flea market, children’s activities, and a whole lot of fun at our show. I’m SO excited to announce a new project! I’ve teamed up with author Terri Thayer, actually she’s the one that approached me with the project over a year ago. She’s writing an 8 month series of stories called Tales of the Quilt Shop, and I’m creating an applique project to go along with it called Sugarplums. You have GOT to go and take a look at the first block on Holly’s Blog Sprinkles of Thought. If there were anything cuter it wouldn’t be allowed by law. Way to go Holly! 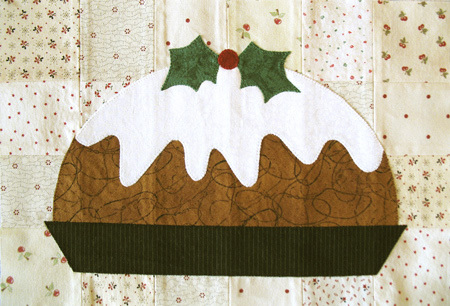 Not only that, Holly includes a link to her glue-stick turned-edge hand-appliqué tutorial. 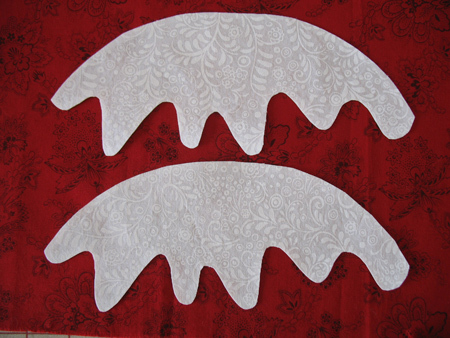 I really need to see a step-by-step tutorial of you working through difficult parts of appliqué: inner curves, outer curves, points, what to do when a curve is pointy rather than curvy, etc. In other tutorials I see the beginning and then the end of a piece without the process in between. Love your blog!! First of all, thank you so much Daniquilter for your nice words about the blog! I enjoy writing it. Remember that you can always use the Categories and Keyword Search function to find information about topics in appliqué. If you’re subscribed by email, you’ll need to click over to the blog itself, so that you can see and use the sidebars. My next quilt show is in Phoenix, Arizona, January 26-28. It’s the Quilt, Craft & Sewing Festival at the Arizona State Fairgrounds! If you’re in that area, I hope to see you there! 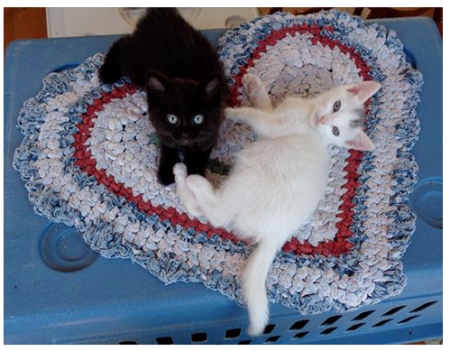 First of all, thank you so much to everyone who responded with warm enthusiasm for my foster kitten stories. There’s a followup… but I’ll save that for later. Several of the projects that appear in my book A Merry Little Christmas to Appliqué are on loan to my pal Debby at the Quilter’s Faire in Palm Desert, California. 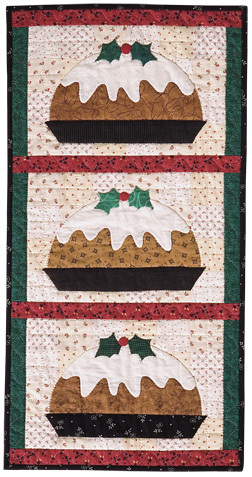 When a traveling quilt-show vendor specializing in Christmas expressed an interest in carrying the book, I thought I’d make another version of the project that’s the most popular one… Plum Pudding! It was loads of fun rummaging for the fabrics, and also a little scary. It’s been awhile now since the book came out, but in the scrap bag I found a few leftover squares of the original fabrics used for the patched background! I also had enough of the red sashing and all three fabrics that were used for the puddings! 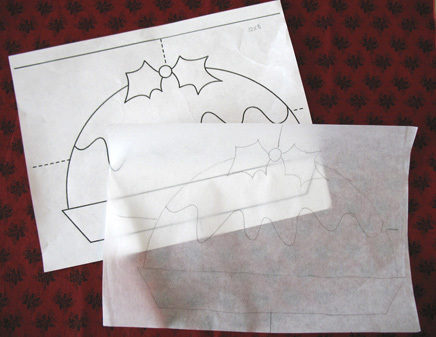 In my files, I even found the original pattern and tracing-paper overlay! Since the pattern is blown up 200%, this saved me a step. That’s why I keep stuff. You never know. Once I’d pulled all the fabrics, I started thinking about the great expanse of white that makes up the ‘hard sauce’ part of the pattern. It would be covering a weensy bit of the brown, and also the patched background, and I didn’t want those to shadow through. Usually, for machine appliqué I would use a double layer to create a light-over-dark motif by first fusing two layers of fabric together and then using that composed fabric to create the motif. This time, the area was so large, and I didn’t want the stiffness from the extra fusible. I thought I’d try something new. 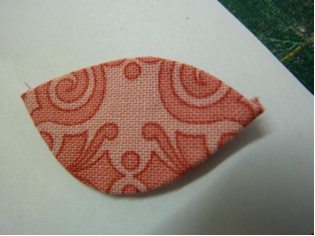 I started out by making two motifs just the same, both with the inside of the fusible web cut out. I removed the paper backing from both, placed one on top of the other on a nontick appliqué pressing sheet, and tacked them together with a hot iron. 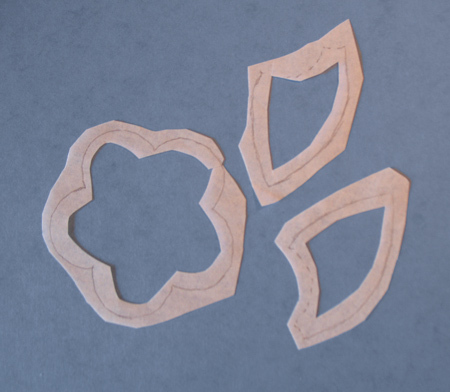 If there are are inconsistencies in the two shapes, just use your scissors and trim them to match. A little haircut needed here. 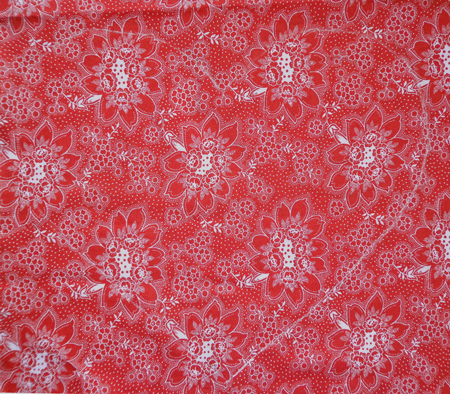 Now the motif is double-layer and with no fusible web in the middle to make it stiff! Try it! It worked for me. The next Schoolhouse that I went to was presented by the Quilted Crow Girls, Leonie and Deirdre, who came all the way from Tasmania! That’s a small island off the coast of Australia! They were delightful to listen to. In addition to these, there are many more woolies in the blogroll (right-hand sidebar, at the bottom). Did you know that if you hover your mouse over a link, a little tag will pop up? Look for “wool” in the pop-ups and you’ll find a bunch. Also, click on the category “Wool” in the left-hand sidebar and you’ll get all of the articles pertaining to wool that have already been published on the blog. A really good one is Kaye Moore’s guest post, and there’s a fabulous photo tutorial on the Cottons ‘n Wool blog. The Quilted Crow Girls laid a free pattern on their Schoolhouse attendees. Nice! 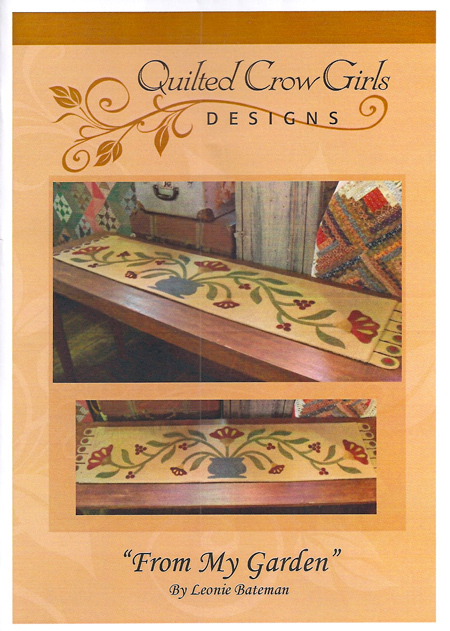 I’m passing along this gorgeous wool appliqué runner pattern in a drawing. If you’d like to win, leave a comment by 7:00 p.m. California time on Saturday, May 28. In your comment, feel free to pass along any wool tips that you might have to share. Contest open to U.S. and Canada addresses only. Thanks everybody for the great suggestions for appliqué topics! I’ve got ’em all down on my list. I love this from Sharon Decker! I spent years not doing the “A” word. Why, because I didn’t realize there was more than one method. Once I learned backbasting, I became a convert. I now tell people who are either afraid of applique or haven’t even tried it that they just need to find the method that works for them. “One size does not fit all.” I don’t think people really understand how many methods there are and they just need encouragement to find what works for them. Right on sister! You’re preaching to the choir! Most of the questions were about hand appliqué, in fact a whopping 76%! Back in August 2008 I posted a photo tutorial of back-basting. Instead of just linking to it, I thought I’d repeat it here, adding in a few new comments in blue to address some of the back-basting questions. No glue, no starch, no freezer paper, no fusibles, no overlays, just fabric and thread… what could be less bulky? I hope the following visuals will help you refine your strategies. Give it another whirl! Clip and remove a section of basting stitches. In this freed-up area, start turning and stitching. 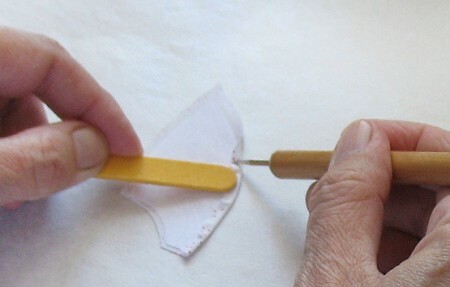 Keep clipping and removing the basting a few stitches ahead of your appliqué. The thick needle and heavy basting thread leave behind temporary perforations that help the fabric turn along the stitching line. I use a size 10 milliner needle and DMC 50-weight cotton machine embroidery thread for appliqué. Christy, back-basting is actually a preparation method. 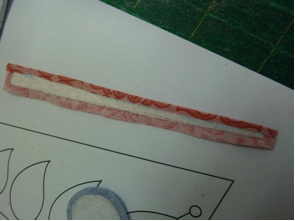 The ‘smooth curves’ aspect comes along in the stitching part, which is just like traditional needle-turn. The culprit in chunky curves is the turning allowance and how it’s acting underneath the appliqué edge once it’s turned. First, make sure your turning allowance is not too wide. A quarter of an inch is actually too much. Trim to about 3/16″ of an inch, and distribute the bulk of the turning allowance smoothly underneath as you stitch. Make sure it’s not pleated up on itself under there. I have really come to love this method, since it gets me on the sofa stitching a lot quicker instead of fiddling around with freezer paper templates at the ironing board. I hope you enjoy it too. Like anything new, it takes practice, so give it a whirl and then another! FYI, back-basting is written up and illustrated in my books Teapots 2 to Appliqué, Easy Appliqué Blocks, and Inspired by Tradition, all available at Amazon and my website, By Kay Mackenzie.